David La Vaque has covered all but one state hockey tournament game since 2009 and has worked as a Star Tribune high school sports reporter since 2004. His favorite tournament experiences include cheering for alma mater St. Paul Johnson in 1991 and staying for most of the Apple Valley/Duluth East marathon semifinal game in 1996. Loren Nelson has covered every state tournament since 2009 as the national media editor for Sport Ngin. He attended many, many other Tourney games as a high schooler from the far northern reaches of Minnesota making the annual pilgrimage south to the old St. Paul Civic Center in the 1980s. Long considered the gold standard of holiday tournaments, the aptly named Schwan’s Cup Gold Division had one of its strongest fields in recent memory last December, featuring six of this year’s eight state Class 2A tournament entrants. Centennial, Edina, Hill-Murray, Minnetonka, St. Michael-Albertville and St. Thomas Academy all participated in the event that started in 2001, with St. Thomas Academy beating Minnetonka in a shootout for the championship. Defections to two other holiday tournament have gutted the tournament of many of its mainstays. 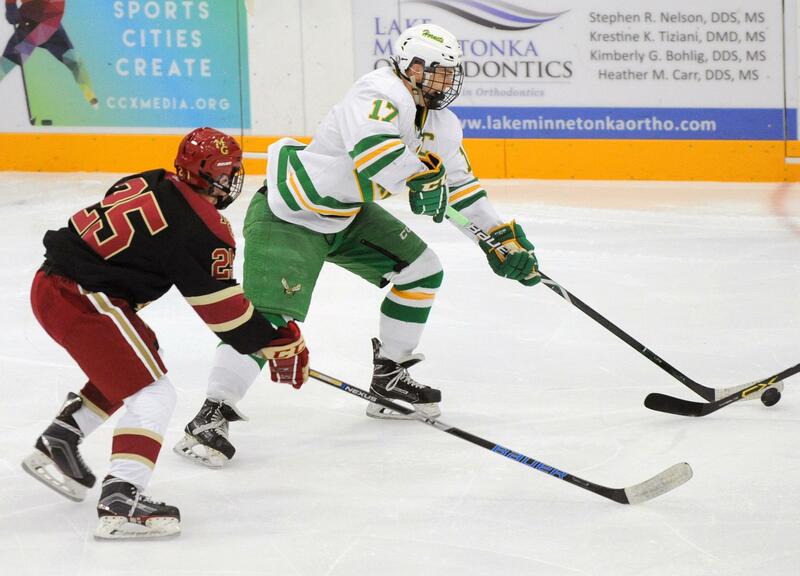 Next season Edina, St. Thomas Academy and Eden Prairie all will play in a holiday tournament in Prior Lake. Minnetonka, meanwhile, will play in one in St. Louis Park. Those departures, and St. Michael-Albertville’s drop down to the Silver Division for the next tournament, leaves the Schwan’s Cup Gold Division with four teams. Burnsville, Centennial, Cretin-Derham Hall (moving up as the reigning Silver Division Champion) and Hill-Murray. “We could’ve had eight teams next year but we didn’t want to backslide on talent just to fill the bracket,” said Barclay Kruse, Chief Communications Officer for the National Sports Center. The Schwan’s Cup Gold Division has always been a bracketed tournament with winners advancing each round to a championship. The competing tournaments both offer round-robin play with predetermined pairings. All of the tournaments offer three days of play after the Christmas holiday and, usually, just before the New Year’s holiday. Some coaches, such as Eden Prairie’s Lee Smith, said the idea of playing three top-quality opponents not already on the schedule is part of the lure of round-robin events that allow, to an extent, coaches to hand-pick their opponents. For Smith, that means he’ll get to play Chaska, Lakeville North and Moorhead – teams that traditionally have not been on the Eagles' schedule. The upcoming Schwan’s Cup Gold Division is scheduled for Saturday, Dec. 29; Monday, Dec. 31; and Tuesday, Jan. 1. After a one-year hiatus, the holiday tournament at the St. Louis Park Rec Center will return with Benilde-St. Margaret’s, Cloquet-Esko-Carlton, Elk River, Holy Family Catholic, Lakeville South, Maple Grove, Minnetonka and Wayzata expected to be in the fold. The holiday tournament played in Prior Lake at the Dakotah! Ice Center debuted last year and is expected in its second year to have a field of Chaska, Eden Prairie, Edina, Lakeville North, Moorhead, Prior Lake, St. Thomas Academy and Stillwater. Several coaches also said they like having their varsity and junior varsity teams playing in the same facility, a convenience offered by the tournaments in Prior Lake and St. Louis Park. For the Schwan Cup Gold Division, championship round games have been played at Ridder Arena in Minneapolis. The rest of the varsity games, and all of the JV games, typically have been played at the Schwan Super Rink in Blaine. While most of the state's top programs are represented in the three tournaments, three powerhouses remain free agents. Andover, Duluth East and White Bear Lake, all expected to have strong teams in the coming seasons, didn't participate in holiday tournaments last year.